Crazy Eights is a simple card game with a goal of shedding all of the cards in your hand until you have none remaining. Although there are many variations, the basic strategy remains the same. When deciding whether to stay in the suit or match the rank but switch suits, always try to keep the current suit matching whatever you have the most of. If the card played is the five of spades, you have the choice of playing a five or a spade. If you have a hand full of spades, play the high one and stay in the suit. If you have a hand full of clubs, play your five of clubs to switch to a better suit. Generally speaking, if matching the suit when you play your card, you want to play your higher cards first. Because the higher cards are worse for you if they get stuck in your hand at the end of the game, you want to play them sooner rather than later. However, the first strategy takes priority; better to play a lower card if it keeps you in a good suit. If a leading opponent has recently played an eight and declared a suit, and you can change the suit before that opponent gets another turn, do so. The chances are good that the player who played the eight has named the suit they need to get rid of their last few cards, so changing to a different suit might help foil their plans. Save your eights for late in the game. Early on, it can sometimes even be better to draw a card than waste an eight. You'll need them later. Be sure to dump all of your eights before the end of the game. If you don't, you will face a steep penalty for having them left in your hand. Once an opponent goes down to one card, it's time to play your eight. 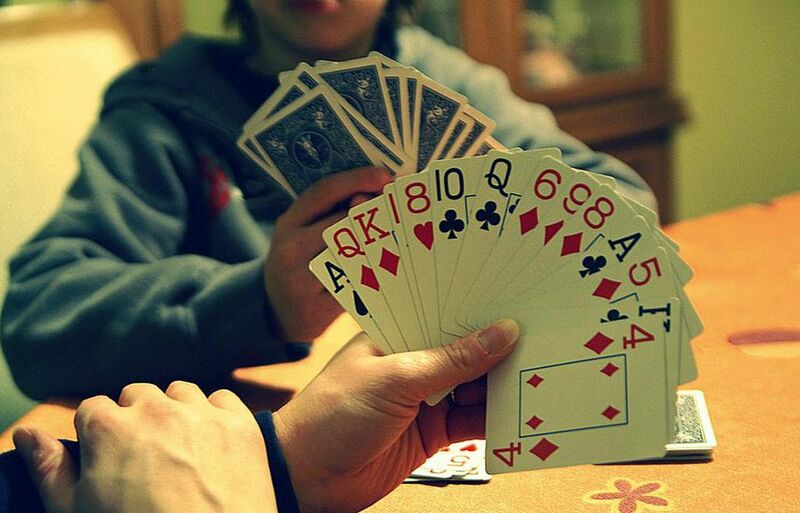 If you have two eights, start playing them once an opponent goes down to two cards. If an opponent goes down to a single card, use your eight to try to change to a suit that the opponent won't have. Use your special cards to hamper the leader. If the player on your left is winning, skipping over her or making her draw cards is good. If the player on your right is winning, you might save your power cards until someone reverses play so that you can attack that player instead. Don't save your eights until the last card if playing with specials. If you aren't guaranteed a turn every cycle around the table, consider playing your eights once someone gets down to three cards. Otherwise, you may be holding an eight when your turn is skipped, and the game ends.